When the US-Ethiopia engineered UN Sanctions resolutions were adopted by the Security Council, it was done using similar underhanded shenanigans. The US claimed that it was an “African Initiative”-it was not. African states on the UN Security Council and IGAD members such as Djibouti, Ethiopia and Somalia served as the “African Faces” for US agendas against the State of Eritrea. In July 2012 the US and Ethiopia employed similar tactics to pass another unjust, unwarranted Resolution against the State of Eritrea, this time it was at the UN Human Rights Council in which Ethiopia was a member of the Council. Once again, Djibouti, Somalia and Nigeria served as the “African Faces” to advance Ethiopian and US agendas against the State of Eritrea whilst members of the Eritrean Quislings League (EQL) served as the “Eritrean Faces” for the minority regime’s agendas vis-a-vis Eritrea. Since its establishment in 2006 as the successor body to the disestablished Commission on Human Rights, the Human Rights Council, made up of 47 United Nations member States, has a mandate to strengthen the promotion and protection of human rights, to address situations of human rights violations and make recommendations. 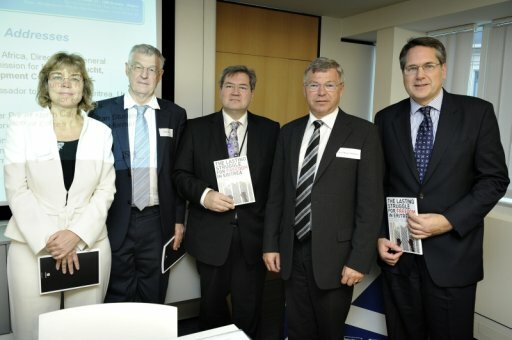 In its former incarnation as the Commission on Human Rights, it developed a reputation for allowing the participation of notorious human rights abusers, undermining its legitimacy and its reputation. Reconstituted as the UNHRC in 2006, the new forty-seven member body has a higher threshold for membership as well as a universal periodic review (UPR) process, which evaluates the human rights records of states, including those on the council. Yet, with the introduction of politically motivated activities by Council members such as Ethiopia and politically motivated interference by international NGOs such as Amnesty International, Christian Solidarity Worldwide the integrity of the new body and its efficacy in dealing with human rights issues has been compromised. As Eritrea prepares for the Universal Periodic Review (UPR), a flurry of activities by these notorious NGOs and their Eritrean surrogates, designed to hijack the process and prevent Eritrea’s voice from being heard, are in full swing. UN Resolution 65/251 stresses that the work of the UN Human Right Council (UN HRC) shall be guided by the principles of impartiality, objectivity and non-selectivity. 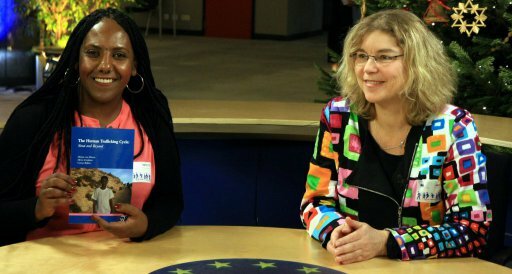 As the record will show, it is not by coincidence that Sheila Keetharuth was appointed Special Rapporteur for Eritrea… as the Government of Eritrea has been her target for quite some time, and the UN HRC is a means to achieving the goals of her sponsors. Her background and activities against the Government of Eritrea on behalf of known anti-Eritrea political groups and individuals is a matter of public record and will be briefly mentioned below. Sheila Keetharuth, the UN Special Rapporteur on Eritrea has undermined her credibility and integrity and should consider recusing herself as her impartiality is seriously questioned, not because of the inherent flaws in the mandate itself, but because of her past and present entanglements with anti-Eritrea elements who are obviously influencing her judgment. Such blatant affirmation of prejudice takes away from the good that Special Rapporteurs should do. States such as Eritrea can work productively with those who are concerned with Human Rights, and Human Rights only, and not those advancing a political agenda…compromising the credibility and integrity of the Human Rights regime…. In 2001, the Eritrean Diaspora was introduced to the Eritrean Quislings League (EQL), bandwagon activists with lynch mob mentalities, who falsely claimed to be representing a large section of the Eritrean Diaspora, when in fact, their support remains minimal or non-existent. This assortment of like-minded defectors, disgruntled runaway diplomats, pedophiles, rapists, self-professed “intellectuals and professionals”, deceitful counterfeiters, information launderers and an assortment of shameless scandalous opportunists have made it their forte to defame and vilify Eritrea, its people and its leadership. The very first thing they did was create various cyber political parties, cyber “human rights”, “journalists”, “religious persecution’ and “democracy” groups. It was their way of entering into the NGO network. These faceless Astro turf groups emerged under various names. While only a handful remain today, at one point, these fake “human rights” and “democracy” groups set up 47 one and two-persons groups throughout Europe and the United States. Some of these individuals have established many organizations under their names, and some of these NGOs have falsely claimed to be “human rights organizations,” granting them an aura of objectivity and credibility (“the halo effect”). They also served as the “Eritrean Faces” for western and Ethiopian agendas against the people and government of Eritrea. They conduct their activities in secret because they know that they do not have the support of the Eritrean people in Eritrea or in the Diaspora-with the exception of a few family members. These groups and their western NGO partners used the Human Rights Council’s complaint procedure (formerly known as “1503 procedure” and currently regulated by resolution 5/1 of 18 June 2007) which addresses communications submitted by individuals, groups, or CSOs concerning consistent patterns of gross and reliably attested violations of all human rights and fundamental freedoms occurring in any part of the world and under any circumstances. This procedure is supposed to be confidential. Since the establishment of the Human Rights Council in 2006, while thousands of complaints have been submitted to the procedure each year, only 14 complaints were ultimately referred to the Council, of which only two referrals were made public. The HRC, at the behest of the United States, in 2012 accepted the complaints filed against Eritrea by these politically motivated groups and by Resolution resulted in the appointment of the Special Rapporteur, despite Eritrea’s engagement and communication. It should be recalled that in 2011, there was a document submitted to the UN Human Rights Council by a group called Jubilee Campaign. As someone who has closely followed anti-Eritrea campaigns by “Christian” groups such as Strategic World Impact, Voice of the Martyrs, Christian Solidarity Worldwide, Jubilee Campaign, Release International and the many Eritrean surrogates that have mushroomed in cyber space since 2000, it was not hard to guess who was behind it. Within days of that Jubilee Campaign submission to the UN, the mercenary minority regime in Ethiopia was shedding crocodile tears and making statements on behalf of the Eritrean people. Eritreans have become accustomed to the minority regime’s wailings and non-descript NGOs with absolutely no constituents (except in the EQL) to purport to speak on behalf of the Eritrean people. The “cut and paste” contents of the 5-page report to the UN was a continuation of the 12-year long campaign against the people and government of Eritrea by Amnesty International and its partners. Notwithstanding the fact that Jubilee Campaign was in violation of the UN’s own rules and had repeatedly abused its “consultative status”, there was nothing new in the report. The underhandedness and attempt to corrupt the UN process is evident in its futile attempt to conceal the status of Christian Solidarity Worldwide (CSW). For those who do not know, CSW lost its “consultative status” for its campaign of vilification and defamation against the Government and people of Sudan in 1999 and it has yet to be re-instated but its anti-Eritrea agendas persist. Eritrea rejected the resolution and said that the UN HRC was flouting “the Council’s impartiality and admissibility criteria” as the outcome was not a result of “impartial process of fact gathering and ascertaining”. Eritrea was not been given the opportunity to provide essential information and evidence, and what it has been able to present in the very limited time was “ignored”. The whole process was “carried in a hasty manner” and was “based on a biased approach of swallowing the charges by Eritrea’s detractors and ignoring Eritrea’s replies and evidence”. The manner with which the UN rapporteur was appointed is also suspect. The selection of the Rapporteur preceded the decision to conduct an investigative mission in Eritrea. The HRC should not have considered Sheila Keetharuth from the onset, as her background and close association with the minority regime in Ethiopia, and the Eritrean groups opposed to the Government of Eritrea made her prone to bias and she ought to have been eliminated from the candidate list. The Rapporteur chosen should have been one that was not deposed to a political finding, competent and not committed to a perceived outcome-in the case of the Rapporteur on Eritrea, both criteria were ignored. Keetharuth does not appreciate the distinction between factual findings in the domain of human rights, as opposed to a political findings. While Susan E. Rice was serving as US Ambassador to the United Nations, her office arranged for Tsedal Yohannes to address the UN Security Council. She is the sister-in-law of Petros Solomon, one of the G-11 who are detained in Eritrea for crimes against the State of Eritrea and its people. This person, and other members of her family, has also been given access and forum to the EU and other forums arranged for her by European and US NGOs. She is advocating on behalf of her family members-no problem there and no one can fault her for trying. It is one thing to advocate for family members, but a completely different mater to drag the entire nations down whilst doing so. Calling for the diplomatic, economic and political isolation of Eritrea, stopping development aid and sanctions against the State of Eritrea is unacceptable. When the President of Eritrea, H.E. Isaias Afwerki asked to address the UN Security Council (UNSC) on issues relating to the sanctions against his country and people, Rice deliberately delayed the issuing of his visa and prevented him from addressing the UNSC, but made arrangements for Ethiopia’s Meles Zenawi, and other IGAD members to address the UNSC via video conference. So much for impartiality & neutrality. 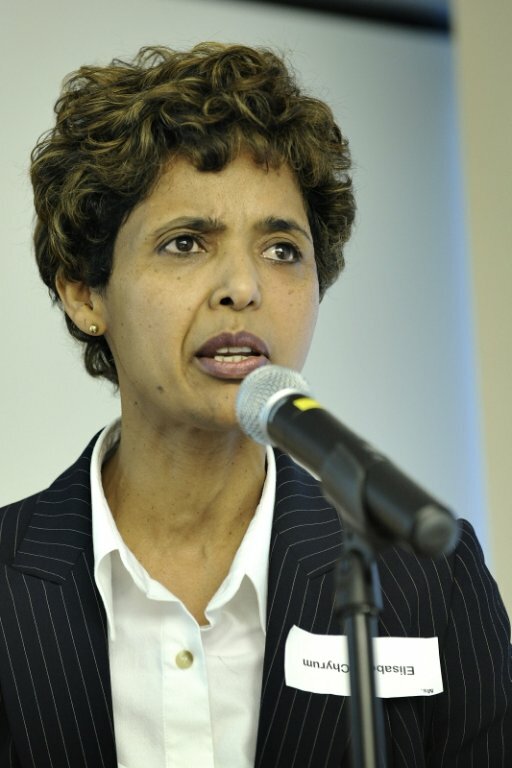 Members of the EQL, who represent a handful of families and with virtually no constituents in Eritrea or in the Diaspora, are allowed to present damning reports on Eritrea to the UN Human Rights Council and other UN forums, but Ms. Luul Gebreab, President of the National Union of Eritrean Women (NUEW), an organization that represents over 200000 members in Eritrea and in the Diaspora, is denied a visa to enter the United States and attend sessions of the Commission on the Status of Women (CSW) and present her on behalf of the Eritrean people. The US claimed that it had run out of “visa stamps”…yet it grants landing visas to runaway defectors and disgruntled diplomats who abandon their countries. By the way…it is the same tactic that the minority regime in Ethiopia used to keep Eritrea’s voice out of the African Union. 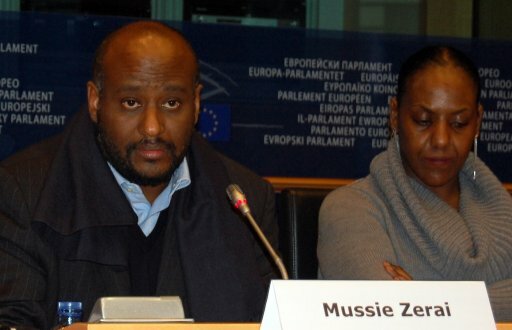 The African Commission on Human and Peoples’ Rights (ACHPR) took on the case of the G-11 and journalists detained in Eritrea, but refused to consider the case of the 80,000 Eritreans and Ethiopians of Eritrean origin who were deported from Ethiopia at the height of the Eritrea Ethiopia border conflict. The case against the Government of Eritrea was filed by Mussie Ephrem of the Movement for Democratic Change (relative of Herui Tedla). Without conducting a thorough investigation, it rendered a decision against the State of Eritrea. Eritrea has rejected the ACHPR decisions as it has the UN HRC’s decision because they both violate the rules that govern their mandates and violate Eritrea’s right to due process. 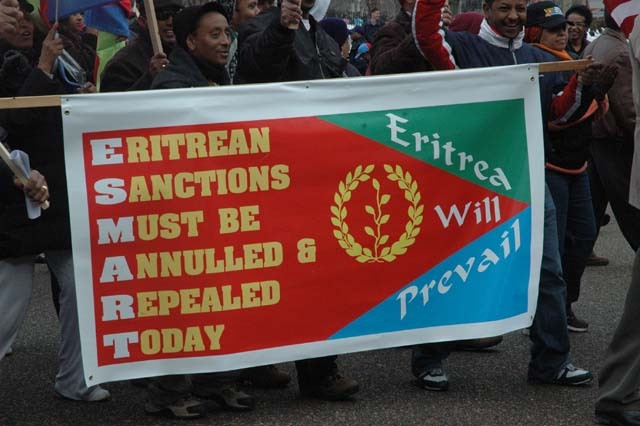 Launching a vilification and defamation campaign against the Government and people of Eritrea, the EQL sought to hijack Eritrea’s political, economic and social development. The political manipulation evidenced in the last 13 years is unprecedented and served to raise the awareness of the Eritrean people and to vigilantly stop their recklessness. Rejected by the people of Eritrea everywhere, especially in the vast Diaspora, the EQL turned to western institutions such as Amnesty International, Human Rights Watch, and Committee for the Protection of Journalists (CPJ) etc. to amplify and lend credibility to their illicit campaigns. Working in tandem with the frightened, frustrated minority regime in Ethiopia, the EQL’s desperate 13 year campaign to blemish Eritrea’s image culminated first in the illegal, unfair and unjust US-Ethiopia engineered sanctions in 2009, and then adoption of Resolution A/HRC/RES/20/20 (without a vote) in 2012. The Resolution was sponsored by Djibouti, Nigeria and Somalia at the 20th session of the UN Human Rights Council in July 2012… once again at the behest of the United States and Ethiopia. 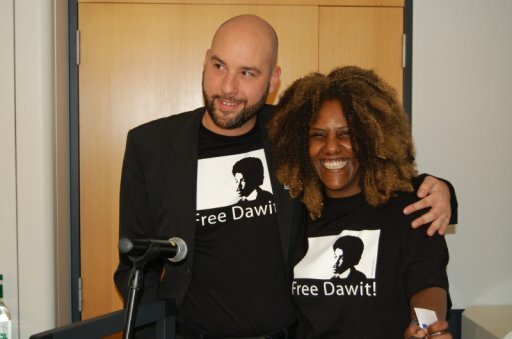 As Director and researcher at Amnesty International (AI), an organization that has been at the center of the 2001-present orchestrated campaigns against the State of Eritrea and its people, she is undoubtedly exposed to the many reports and activities by AI. In July 2002, Keetharuth joined Amnesty International as a Researcher with the Africa Programme (East Africa Team), based at the organization’s Africa Regional Office in Kampala, Uganda. She was the Interim Head of Office until December 2005. 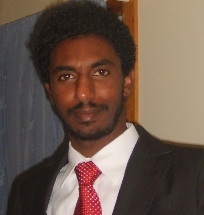 Simon Weldehaimanot, a member of Eritrean Movement for Democracy and Human Rights (EMHDR), is a recipient of National Endowment for Democracy (NED) grant and is also someone closely associated the various anti-Eritrea groups such as the EYSC. While he has authored several papers denigrating Eritrea and its legal and other institutions, he has yet to pen a single paper calling on the regime in Ethiopia to abide by its legal and moral obligations under the Algiers Agreements it has signed. Like Meron Estefanos and the others in the EQL, he also travels to Ethiopia often. Keetharuth’s association with the African Commission on Human and Peoples’ Rights (ACHPR) is also a matter of public record. It should be recalled that the ACHPR accepted and rendered on two cases brought before it by members of the Eritrean Quislings League. The UN HRC resolution mentions the two cases and Keetharuth has clarified that she intends to make Eritrea to abide by its decision, which the Government of Eritrea has rejected outright on procedural and other grounds. How convenient that just a few months later, she is “appointed” as the Special Rapporteur for Human Rights in Eritrea… It is therefore a disservice to the Council in general, and the people of Eritrea in particular, to continue to present Keetharuth as an “independent” Rapporteur, when her past and present activities against the State of Eritrea show otherwise. NGOs such as Amnesty International and Human Rights Watch with their Eritrean surrogates in tow have conducted a vicious 13-year long campaign against the State of Eritrea and its people. Together with the EQL, every institution in Eritrean society has come under attack. They began with maligning the President of Eritrea and the leadership, then proceeded to attack Eritrea’s religious institutions, education system and now the latest campaign is designed to undermine Eritrea’s Defense Forces. The Eritrean Diaspora was not spared either and from labeling them “cash cows”, “propagandists for the regime”, to “terrorists” etc. etc. the members of the Eritrean Diaspora Communities have been harassed, intimidated, and violated. Their properties have been vandalized and their members physically abused. The Eritrean Diaspora has been actively engaged during the struggle for Eritrea’s independence, and in post Eritrea’s economic and political development. From conducting the referendum for independence to the writing of the Eritrean Constitution, this conscious population has never engaged in underhanded and corrupt behaviors as is being witnessed in the EQL and other Ethiopia sponsored groups. The attacks on the Eritrean Diaspora have taken many forms, including violence, harassment and intimidation, disrupting community events, vandalism and more. It is immoral for human rights organizations, AND the western media and UN officials to use phrases such as “North Korea of Africa”, “Hitler’s Y-PFDJ” in their media and anti-Eritrea campaigns, reports etc. etc. It is one thing to present substantiated evidence, but to deliberately tarnish the reputation and image of Eritrea and Eritreans, in order to advance a narrow and myopic political agenda is unacceptable. Gondwe and Reisen activists that explicitly promote hate crimes, xenophobia and political exclusion cannot speak on behalf of the Eritrean people, any more than the miscreants in their employ. These derogatory and inflammatory terms are immoral and employed for emotive goals; they should not be invoked by human rights groups claiming to operate with a human rights framework. Spreading hate and xenophobia is not the work of human rights. It is a matter of public record that NGOs such as Christian Solidarity Worldwide (CSW), European External Policy Advisors (EEPA), Amnesty International (AI) and Human Rights Watch (HRW) have advanced the interests of a select group of Eritreans and their sponsor, the minority regime in Ethiopia-as opposed to the interests of Eritrea and its people. These individuals and groups have also benefited from their 12-year long efforts against the people of Eritrea as evidenced by the many resume padding activities listed and books written on Eritrea. The substantive provisions of that resolution that determined in advance Eritrea’s guilt, both underwrite from the start, the tenor and orientation of the Rapporteurs mission. The fact that this exercise emanated from, and is directed by a few nations on the UN Human Rights Council, such as Djibouti, Ethiopia, Somalia and the US, and from politically motivated individuals and groups who have an ax to grind with the Government of Eritrea, only adds to the questionable nature of Rapporteurs mandate and retracts from any semblance of credibility and reliability. Any expectation and anticipation of impartiality, objectivity, transparency, and professionalism was absent from the get go and with time, exposed the real agenda. Keetharuth’s report presented to the Human Rights Council in June 2013 was based entirely on material submitted by Amnesty International and other international non-governmental organizations known for their anti-Eritrea agenda, and whose biased reports are based on information laundered by the EQL through its many cyber groups, compromised refugees and asylum seekers in Djibouti and Ethiopia. Hardly an impartial grouping… the Resolution adopted then was also drafted by Amnesty International. Keetharuth’s report was an insult to the UN as a whole and to its Human Rights Council. It was also an insult to the people and government of Eritrea, in particular, and to the intellect of all those who read it in the false expectation that it is authoritative and credible. Resolution A/HRC/20/20 of the Human Rights Council, the appointment of this particular Rapporteur, her mandate, and substantive content are, from the outset, based on a premise that considers Eritrea guilty without providing evidence for the many allegations and deliberate misrepresentations and exaggerations of the realities in Eritrea, “cut and paste” from documents provided by Amnesty International, and other anti-Eritrea NGOs. This premise dictates the one-sided and prejudiced nature of the Rapporteur’s June 2013 report. It is therefore a disservice to the Council in general, and the people of Eritrea in particular, to continue to present Keetharuth as an “independent” Rapporteur, when her past and present activities against the State of Eritrea show otherwise. 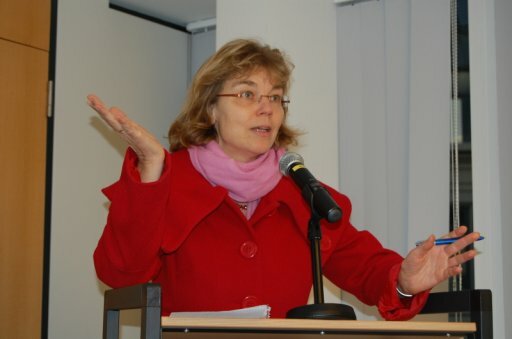 Having relied so entirely on one-sided findings, statements form asylum seekers in Ethiopia, Djibouti and elsewhere, and statements from members of the EQL one may wonder how the Rapporteur could logically claim to have been guided by “the principles of ‘do no harm,’ independence, impartiality, objectivity, discretion, transparency, confidentiality, integrity and professionalism.” Keetharuth’s fact-finding reports blatantly violated best practices in human rights investigations, such as the Lund-London guidelines that mandate reports be “clearly objective and properly sourced”, but it seems she has not yet learned her lesson and is doomed to repeat her mistakes in 2014. Sheila Keetharuts’s actions violate the principles of impartiality, non-selectivity and objectivity that govern the work of Special Rapporteurs. In addition, her statements at the various forums she attended during her recent stay in New York City in November 2013 are examples of her blatant bias, lack of objectivity and unprofessional conduct and expose her real agenda against the State of Eritrea. What is the point of meeting with “asylum seekers” and “refugees” except to gather one-sided accusations and allegations which seem to be compatible with her aims, rather than their validity? In her addition, her meetings with members of the EQL and refusing to meet with members of the wider Eritrean Community (the 99%) says a lot about her objectivity and methodology. Issuing such a slanted and biased report in June 2013 to the UN human Rights Council, and downplaying the issue of the occupation of sovereign Eritrean territories by Ethiopia, the illegal unfair and unjust sanctions imposed against Eritrea at the behest of the US and Ethiopia in December 2009, was an attempt by the Rapporteur, to implant within the international community an incorrect and inaccurate view of a complex reality in Eritrea, to steer the debate away from the underlying cause of insecurity in the Horn region, Ethiopia’s violations of the rights of the Eritrean people by continuing to occupy sovereign Eritrean territories, including Badme. The Eritrean people struggled for over 30 years to free themselves from the clutches of Ethiopian colonization and in defense of Eritrea’s sovereignty and territorial integrity in the 1998-2000 aggressive Ethiopian war of expansion and occupation. The people of Eritrea do not need lessons on human rights and freedoms from anyone, least of all these self-serving individuals and groups, or the Ethiopian regime. The Eritrean people championed that cause, long before it became fashionable and profitable, and long before the EQL considered it a lucrative endeavor. Keetharuth’s report makes serious allegations about a state engaged in lawful self-defense, while letting the aggressor, the minority regime in Ethiopia, completely off the hook. Ethiopia’s continued occupation of sovereign Eritrean territories in violation of international law, over a dozen UN Security Council Resolutions and the final and binding decisions of the independent Eritrea Ethiopia Boundary Commission’s final and binding delimitation and demarcation decisions of 2002 and 2007 respectively, and the resultant political stalemate, present a unique and highly complex situation, that requires sober analysis and understanding. Keetharuth should have striven to be independent and give a fair hearing to all interests affected and report fairly to the Council, not omitting anything that is relevant to be taken into account, or giving weight to anything that is not relevant. She did not. Keetharuth’s exaggerated politically motivated accusations against Eritrea which undermine the history and culture of its people, should not be accepted at face value, and must be tested against credible evidence that is independently verifiable. soft-power of groups, such as Amnesty International, Human Rights Watch and their surrogates in the EQL, who are not subject to any democratic accountability and they should not be assisted by the UN HRC to carry out their political agendas using human rights as a pretext. Keetharuth’s report which is bases on a series of actions by Amnesty International, Human Rights Watch and the newly established European External Policy Advisors (EEPA) evince a pattern of selective treatment of Eritrea. Partisan allegations from NGOs should not be taken at face value. Even without the cooperation of the government of Eritrea (quite understandable in light of the biased mandate and procedural errors by the UN HRC), one might have expected, if only out of concern for her own credibility, impartiality and objectivity, that the Rapporteur would, at the minimum, have consulted with the over 300 Eritrean Diaspora communities who represent the 99% whose voices are ignored by the western NGO and media, in order to verify the one-sided allegations and accusations. Keetharuth did not. She instead regurgitated tired old unsubstantiated allegations against the Government and people of Eritrea made by the Ethiopian regime and its surrogates. Had Keetharuth been truly guided by the above principles, and had she been genuinely impartial, objective, discrete, transparent, professional and with integrity, as the UN HRC presumed her to be, her report would have reflected the views of the over 300 Eritrean Diaspora Communities that sent her letters and requested to meet with her, and the views of the government of Eritrea, provided to her at various international forums, including in Geneva. In light of the one-sided nature of the her work thus far, she should recuse herself as it has become evident that she cannot not meet the very standards of impartiality that is required in order to fulfill her mandate.